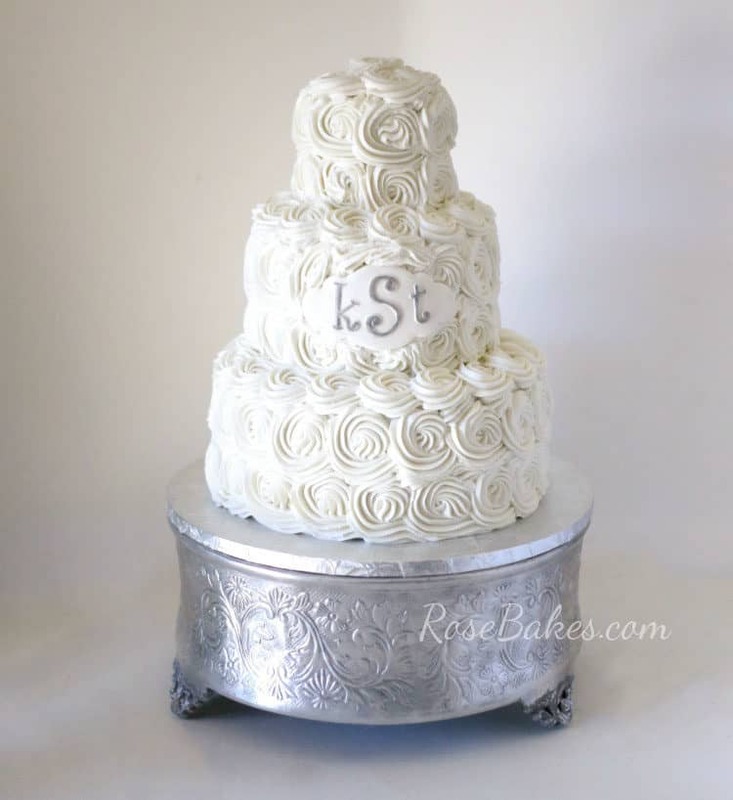 After my dramatic day on Friday, it was nice for things to be less stressful Saturday when I had to deliver this White Buttercream Roses Wedding Cake with Monogram. Today is Day 10 of the Write 31 Days Challenge and I’m hanging in there… barely! I mentioned on my personal blog tonight that I’ve been fighting a migraine for two days. I never ever stay in bed all day, but I did today. Or at least until around 3pm. My head was just hurting so bad, I couldn’t tolerate light or most sounds. Thank goodness Richy was home to manage the kids and the house and all that good stuff so I could rest. I finally dragged myself out of bed in the late afternoon. My head was (and still is) hurting, but it has dulled some and I can tolerate the world for the moment. Anyway, I really want to try to get some good sleep tonight and hopefully beat this headache for good, so I’m gonna keep this short. Hopefully I’ll be better tomorrow and can write a better post for ya’ll! Three tiers: 4″, 6″ and 8″ round tiers baked in my favorite Magic Line pans. The cake was white almond sour cream (aka “wedding cake”) and it was filled and frosted with vanilla buttercream. The customer asked that the buttercream be very, very white, so I followed a tip I saw on Youtube to take the slightly yellow color out of buttercream made with real butter. You can see the video here, but the bottom line is… purple and yellow are opposite on the color wheel, so if you add a tiny drop of violet to buttercream, it will counteract the yellow and the buttercream will be more true white. Isn’t that fun? Just be warned… it has to be a tiny tiny amount or you’ll end up with a pale gray/violet buttercream. Ask me how I know! The roses were piped with an Ateco #825. I used a plaque cutter for the fondant plaque and Funky Alphabet Cutters for the monogram. I sprayed a little Wilton Silver Color Mist onto a saucer, then used a paintbrush to dab it up and paint the letters silver. And that’s it, I think! I hope you all are having a fantastic week! Gorgeous as usual…love the tip about brightening the white…gonna try that. Praying you are well today! Be blessed! Try your meds with Gatorade for your headache. The Gatorade usually works well. Four (yes four) Advil and a Gatorade should help. Hi rose, Tx for sharing the violet trick. Could you advice me on making a smooth buttercream as mine is always grainy. I’ve tried beating butter etc please. Thank you juby. Try changing the brand of powdered sugar that you use. The Great Value brand from Walmart works great for me, but I’ve tried our local grocery store brand and it is grainy. Thank you love you recipe. 🙂 I also don’t measure my frosting as I work. I just make a big batch, use it til it runs out and make another big batch. 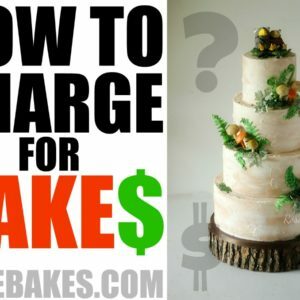 You can also get a ballpark idea for how much you’ll need from the Wilton chart, but for a roses cake, you may need a little more than they recommend. Hey Jenny! I don’t measure my batter as I work, but you can get a good idea from the Wilton chart for how much you’ll need. Thank you Rose I just love all your receipts. You are amazing.